The largest dolphins gathering caught in video in Oslob, Cebu. The video was published on July 10, 2015 by mightyrichful in youtube which became viral and popular online. "Largest Dolphin Pod in Cebu, Oslob - Villa on a Cliff". The video was captured by a drone camera. Several online users from different parts of the country praised and amazed from the said video. We spotted some dolphins in Oslob, at a resort called villa on a cliff. They were about 500 meters out to sea, and we had the opportunity to get our drone up and film them from above. 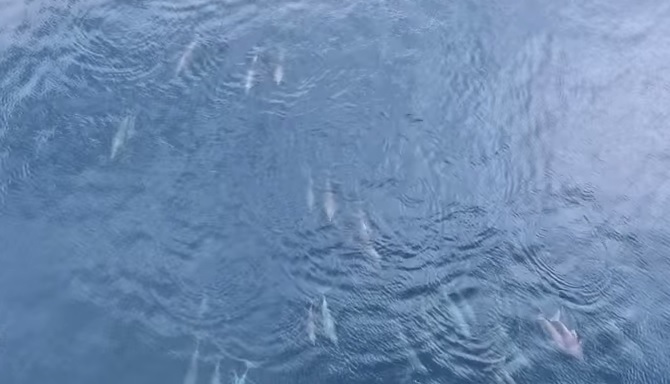 We counted 35 dolphins in the pod, all shot and filmed from a DJI Inspire 1 at Villa On A Cliff, in Oslob, Cebu, Philippines.